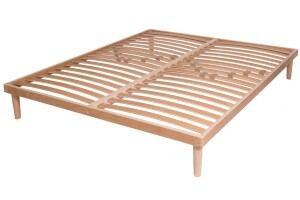 In this category you can find slatted bed bases with ergonomic curved beech slats. Alongside our classic models, we also offer models that are manually or electrically height adjustable to offer the best comfort in every situation. Each slatted bed base can be provided with or without feet, depending on whether you wish to place them in a bed frame or not. The Slatted Bed Base Active in multi-layered beech wood is fastened at the corners with finger joints, which make it very stable. The ergonomic beech wood slats are held together with natural rubber inserts. You can choose the desired firmness in the lumbar region thanks to a set of adjustable slats with double sticks. The ergonomic Slatted Bed Base Elastic in multi-layered beech wood is fastened at the corners with finger joints, which make it very stable. The slats of the shoulder area present millings that make them more flexible for added comfort. You can choose the desired firmness in the lumbar region thanks to a set of adjustable slats with double sticks. The ergonomic Slatted Bed Base Flora in multilayered beech wood with finger joints at the corners is equipped in the shoulder and knee region with interactive disc springs (IFS). It also has sliding tension adjusters, which increase the degree of firmness in the lumbar zone for an optimal support of the body. Increase the quality of your sleep with the ergonomic Slatted Bed Base Flora Deluxe. This bed base in multilayered beech wood with IFS technology disc springs guarantees more comfort in the shoulder and knee zone. The lumbar region has several double slats with sliding tension adjusters for extra support.